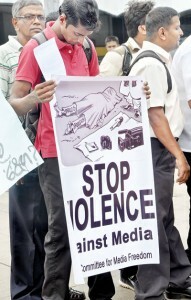 Media organisations backed by rights groups and political parties this week staged a string of protests in Colombo and in outstations against attacks on journalists and the incidents of suppression of the media. In separate protests, the Free Media Movement (FMM) and the Provincial Journalists, backed by about 10 organisations, held demonstrations opposite the Fort Railway Station on Thursday and Friday. The protests were prompted mainly by the attack on a Sirasa journalist and a Lankadeepa journalist and the disruption of a workshop of web journalists in Negombo. Chandana Karuppuarachchi, a Sirasa correspondent, was attacked while filming a clash between supporters of ruling United People’s Freedom Alliance (UPFA) and the main opposition United National Party (UNP). He sustained injury to his jaw and underwent surgery, and is still in hospital. Lankadeepa journalist Palitha Ariyawansa’s vehicle came under attack while he was driving past the demonstration. The main suspect in the attack was arrested and produced in the Badulla Magistrate’s court and later released on bail. A member of the Provincial Journalists, Kanchana Kumara Ariyadasa, said the government was now in the process of targeting provincial journalists as it was trying to suppress them. He said provincial journalists should be more vigilant to expose government corruption. Sri Lanka Tamil Media Alliance executive committee member A. Nixon said since the Uva polls the attacks on media personnel had increased significantly, particularly in relation to provincial journalists. “The government should know that journalists are not against its members. Journalists should be able to do their job without any difficulties or threats. This week another journalist in Jaffna was questioned by TID (Terrorist Investigation Department) officials about his reporting on land grabs and other issues,” Mr. Nixon said. Meanwhile Ratnam Thayaparan, an independent journalist based in Jaffna, was questioned by the TID for more than three hours on Wednesday about his role in the Jaffna Press Club, of which he is a founding member. “I have been questioned by Defence Ministry officials, Criminal Investigation Department (CID) officials and the TID. They asked about the Jaffna Municipal Council bomb blast in 1998. They are trying to get me under false charges,” Mr Thayaparan said. Last week, a two-day workshop of web journalists due to be held in Negombo was also disrupted. Freddy Gamage, Convenor of the Professional Web Journalists’ Association (PWJA) said he had been warned by intelligence officials that if the two-day workshop went ahead the association would face difficulties. “The workshop was to be held on the 27th and 28th at the Rani Beach Hotel in Kudapaduwa. In the morning I got a call from an intelligence official from the Negombo police station saying he had been instructed by the Colombo bureau to stop the workshop. “He said they had received information about a protest to be held in front of the hotel and asked if we were to have training session for our media personnel. They asked about whether [Britain’s] Channel 4 journalists were going to participate in the session,” Mr Gamage said. Hours later, the owner of the Rani Beach Hotel had called to inform him that 12 persons had visited the hotel in civilian clothes and warned that if he allowed the workshop to be conducted at the hotel he would face problems in the future. In a statement, the PWJA alleged that the government was instructing the police force o provide undisturbed space for mobs resorting to violence in order to suppress civil activities. “Freedom of speech and expression, including publication, does not have any worth without the right to information. The right to information and its dissemination is facilitated by the media in any democratic society,” the PWJA stated. It said it was important to have a free and independent media that was responsible only to the country’s citizens. “This regime is violating all these constitutionally-established rights of its citizens who alone are sovereign, and not the regime,” the PWJA said. The Campaign for Free and Fair Elections (CaFFE) said it was deeply concerned about the recommencement of media suppression in the run-up to the presidential nominations of 2015. “The most recent incident of the attack on expression is the obstruction of a workshop for web journalists on cyber-security which was to be held on September 28 at Negombo,” it said. CaFFE Executive Director Keerthi Tennekoon said the incident showed absolute unconcern for freedom of expression. “In the last few years we have noted that it is often new media and social media that pick up issues and create a public opinion on sensitive issues. “By suppressing web journalists the government will be able to minimise the flow of sensitive information to a significant number of people, especially the youth, thus being able to create a monopoly of information,” Mr Tennakoon said. The Lawyers’ Collective said the attacks on provincial journalists had been initiated by government politicians to stop news flow to mainstream media. Speaking on behalf of the Lawyers’ Collective, Mr. JC Weliamuna said that government attacks on Colombo-based and northern journalists had now spread to provincial journalists. “This is the continuation of media suppression in this country. These attacks are well planned and nobody is getting arrested. The state media too is accusing these journalists and portraying them as wrongdoers,” he said. 70,000 more GCE O/L candidates yet to apply for NICs: Registration Dept.